brandflakesforbreakfast: where did all the buzz go? where did all the buzz go? Bees are important, like really REALLY freakin' important. Their pollination is responsible for 1/3rd of the food we consume. 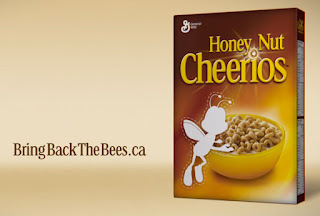 So you can imagine why General Mills Canada believes it's imperative we do something to save them. 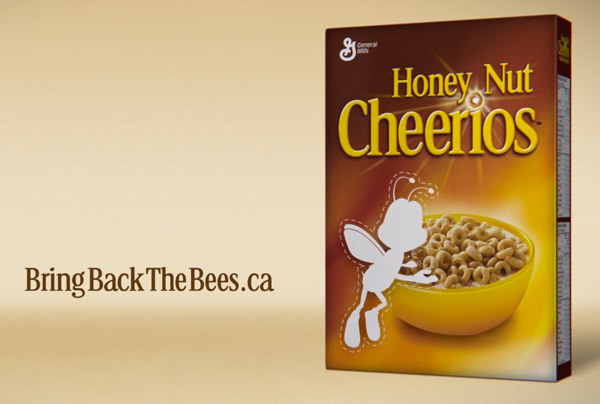 And what better spokesperson for this than Buzz, the Honey Nut Cheerios bee? Well, not exactly a spokesperson, but a symbol for all bees everywhere. How will he do that? By removing his adorable little self from all boxes of cereal for 6 weeks. In addition to that, General Mills created a TV & digital campaign (below) of animals in need that'll make you cry like someone's cutting onion up in there. And the call to action (because what's a good campaign without one) is to register for free wildflower seeds with the goal of planting 35 million so the bees pollinate the heck out of them. Well done!